Love to start like that....anyhoo, so I kinda like some form of order so in order to introduce posts on brides that I have done, I will sort of label them until I find something else that suits me. 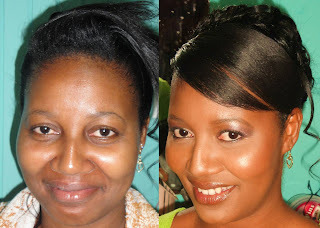 In this episode, I had to do airbrush makeup for the bride however we've never met. Therefore, you can just imagine her jitters of the makeup application, not just the ceremony. Come to think of it, I believe women are more 'jittery' of that than anything else. So, of course, she told me that she doesn't wear makeup at all and was very antsy to see the finished product. I had to keep turning her from the mirror (we were in a hair salon by the way) and calm her down with the airbrush mist. Oh yeah, airbrush makeup also has the ability to make people feel more relaxed as the cool mist is blowing on the face, it acts like what I like to call it 'a mini airconditioner'. Her sister, friend and hairstylist were there as well to help give her confidence and as they put it 'to tell her if the makeup doesn't come out well'. Of course you know, not on my watch! Lol! The pic below shows the before and after....Her skin is really lovely up close and wasn't hard to manipulate but as she has a fuller face, I had additional contouring to do around the perimeter of her face and light color to the cheeks as opposed to obvious blush applications. Her eyes also had to be contoured (slightly) as they have a tendency to droop, so I applied the outer crease colour in an upward fashion to make it more almond shape. She also is not a lover of lipstick (no suprise there!) and I applied generous lipgloss applications where it was in keeping with her simple, yet sophisticated look. You can just imagine her reaction when I showed her the pics! She loved them and then turned into a diva...continuously posing for our cameras in all different angles at the same time saying, "I feel I will give the photographer trouble today"...yeah right :-). I was very happy to see her light up when she realised it was just enough for her and how the overall look would be with the dress and accessories. By this time, she is a happily married woman and I wish her all the best! WHO SAYS YOU CAN'T HAVE FUN WITH COLOR? I had a hectic Saturday as I was asked by my favorite girls to do their makeup starting from early in the morning. They each have a penchant for being asked to be part of some wedding - either through coordination or designing the outfits, they are very popular as they are sweet! So, they told me that they wanted to look 'hot' or as Tyra Banks says it 'fierce'. Although four of them requested makeup, I got really great pics with two of them and only one was actually part of the bridal party, Angel. With her, she has acne scarring so I had to use TemptuPro S/B Makeup on her and I also included the Airbrows and DINAIR Eyeshadow to complement the outfit. I chose a jewelled turquoise eyeshadow tone and eye contour color to complement the orange in the dress (which she made by the way!) and bring shape to they eye. I also added pink hued lipgloss to tie the look together. With her sister, Crystal, she always asks for contouring on her nose, but I also wanted to include some sea colors on her and show that dark skin shouldn't shy away from them. The colours on her were from coastal scents which were a mixture between aqua blue and violet. I contoured her eyes with a dark violet to give some depth and as she has small eyes, rimmed the entire with the mixed colors (inner corners - lighter blue and outer corners - indigo blue). Sufficit to say that these were my best pics considering they were rushing out the door. Who says you can't have fun with color? If in doubt, pick up a Color Wheel and look for the color you like and then check it for a color that will complement it. The idea is to emphasise each color and add to the overall vibrancy and not look too 'matchy-matchy'. I have some other blogs to do on another bride I did today and an upcoming 'Makeup Lookbook Series' which will detail step by step with text how to do eye looks. Well I have a tad bit of sad news as the carded Makeup Workshop that I previously mentioned was happening on Saturday has again been re-scheduled to a new date in June. Its supposed to coincide with Fashion Week 2K10 however I won't be able to attend cause of the timing within the week. So sad face :(.....Anyhoo, I will have to check out and see if Revlon's Sam Fine appearance will be on a weekend and the price. A follower indicated to me that she found the blog entertaining, (thanks Kim!) however it is from my point of view. So I want to involve some participation from you guys and what I will do is request from time to time that you send me requests of what you will like to see reviewed or discussed. Oh by the way, I am attending the Celebrity Makeup Artist Worshop with Theo Faulkner this Saturday at the Hyatt Regency in Port-of-Spain. The event is carded for 1:00pm to 6:00pm. If you google him, he's quite an accomplished makeup artist who has worked with Tyra Banks, Oprah, Magazines, Ciara, Runway Designers and the like. Click on the link to see the details Workshop Details. I will be taking pictures and making notes to come back and report to you guys what it was like to interact with someone of that ilk. Exciting! If you only know how long I was waiting for this to occur. I seem to be getting a bit more regular at this blogging bit (somewhat) cause here I am again. 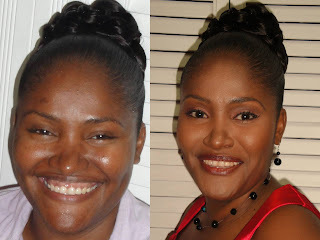 I apologise for being late with this post but I will give a run-down of what I experienced at the last Health & Beauty Trade Show 2010 held at Crowne Plaza between May 01 to 03, however, I was only able to attend one day - the opening and can talk about that. To tell you the truth, I have always seen it advertised and noted the fact that airbrushing was also noted in the list of activities but for some reason was never inclined to go. I can usually be found at bridal expos, so when I was invited to attend by international hairstylist - Mr. Clem Lue Yat to do makeup for his model, my interest was piqued to see what was offered and guage the crowds/audience's reactions. Let me say that I was pleased to see the number of booths that were there, probably over forty (40) booths (if I am off in the numbers, forgive me). There were skin lines, cosmetic lines, hair products and spas to name a couple. As such, there was a lot of information available but the times I was on the floor, the crowd fluctuated ranging from very busy to few attendees. I think that from a supplier of services perspective, if I were to offer classes in airbrush makeup, this would be a great vehicle to advertise but if I were looking for clients, I would focus on bridal expos. Some pics are below. I finally perched at Clem's booth, of course you know that he will attract attention as he is not only considered a 'master weaver' but he was one of the few actually styling a lovel model's extremely long hair in front of the patrons. He was kind enough to let me set up and advertise my airbrush skills and pass out cards (thanks Clem!). I did her makeup to suit her face and overall look which was slightly smokey in the entire crease and everything was airbrushed except her blush and lips. 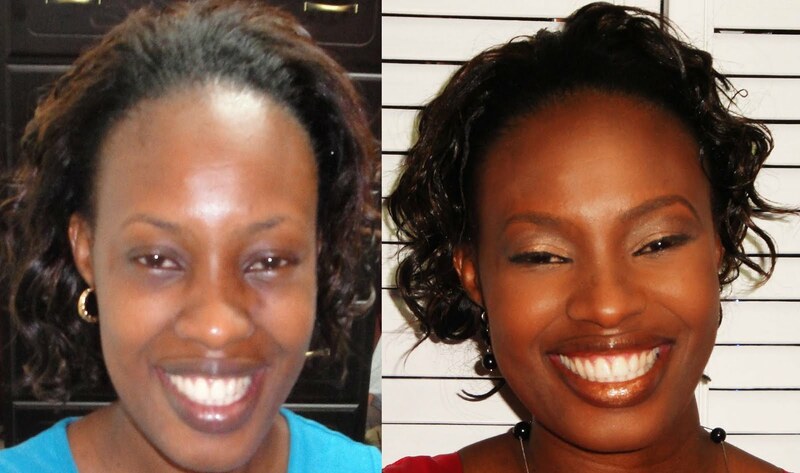 Her foundation was OCC Skin foundation and setting powder was from my trusty Graftobian Powder Foundation Palettes. The eyebrows were done with TEMPTUPRO AIRBROWS Kit - which I must say is very, very nice....quite blendable. The eyeshadow colors used was DINAIR AIRBRUSH EYESHADOW in Gold & Blue and also blendable without clogging. A great feature of the Dinair Line of airbrush makeup. Her skin was bronzed with LUMINESSAIR Matte Bronzer around the perimeter of her face to create a glowy effect and blush was an orange tint from SACHA COSMETICS. The final look is below. Some really cool items on the activity list for the opening were the Hairstylist & Makeup Artist Competitions. What I was told was that students from YTEPP compete in this competition every year, and let me tell you, from the little I did see of the Hairstyles, these students are INCREDIBLY talented. Unfortunately, cause of my duties, I was unable to stay and view the Makeup Artist competition but if the first one was anything to use as comparison, I am certain, they would be just as great! So after all that rambling, yes I had a good time, met some great people and would suggest that you go, to get some excellent savings as a regular citizen. The question remains, would there be benefits as a service provider? Well there were a lot of them there so it would appear to work in their advantage but I personally prefer bridal expos. I would only consider if I want to advertise classes, but considering the budget that will be involved in that, I am sure there is another way to advertise them. Again, only my personal opinion! I think by now followers can guess that my style is soft beauty that is appropriate for the 'every woman' as all they want, is to look what I term 'dramatically beautiful'. They want the wow factor but still want to identify themselves and go beyond the current trends. I adore the glow and bronzer effects and try to incorporate it as much as possible in my makeup looks. I did that today with my job of wedding party of five, inclusive of the bride. They kept mentioning to me that they wanted natural (this term however seems to differ person to person) and were very apprenhensive since they don't typically wear makeup on a daily basis. In fact, they indicated (all of them) that they don't have much of a skin care regime and the soap bar sneaks in, once in while, to clean the face. The horror!!! Of course, you know I poo-pooed that and pointed out the right things to do. The ladies were game and were willing to see the results of the airbrush makeup (mucho eager!). Well as you guys know by now, I was involved in the captioned pageant for one of the contestants - Ms. Kerniel James from Tobago. It was held at Cascadia Hotel in St. Anns, Trinidad and to tell you the truth, I didn't even know it existed but there are a lot of them occurring more frequently now. Its great for the contestants though, as one of my friends told me, it builds character and confidence that may not be developed in another environment. However, when she finally arrived, I got it together and did a 'cut crease' look with eyeshadow from Coastal Scents and the airbrush foundation was OCC. I wanted to use TEMPTUPRO AQUA as its just there in my kit but didn't want to experiment on that night. As I mentioned before, I left earlier - around 8pm - not really that early but the other MUAs were working on their ppl and I was told later that the 1st pick of the top ten wasn't even called and it was around 12pm. Not me! I really hope though that she did well, I think she looked gorge, but hey I'm biased. Here is the final pic of what she looked like, of course I will not put her before. Enjoy!